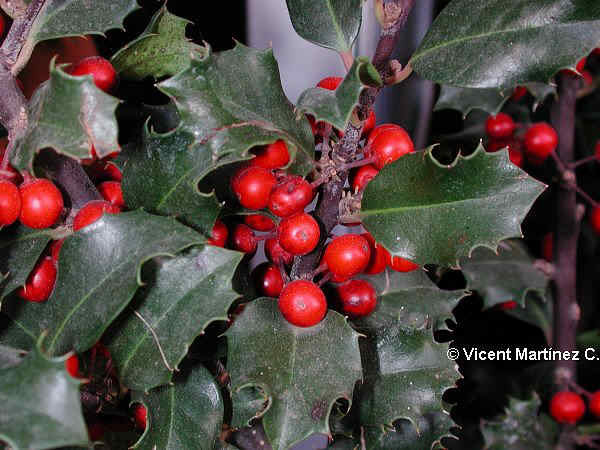 Dioecious tree of the Holly family – Aquifoliaceae, usually 10 m tall (It can attain 25 m). Erect stems with smooth bark, light grey, and bright green branches. Alternate wavy leaves, elliptical or ovate, bright green,,coriaceous with strong spines (Specially those near the ground; superior ones sometimes spineless) Flowers in different trees, the female ones with four petals, white-greenish. Fruits till 12 mm in diameter. They are red berries when mature. Beech and oak woods and hedges of humid climates.